Shoe manufacturer Clarks has been selling shoes for 187 years, but is moving with the times to implement a host of digital technologies for the supply chain and its stores. As part of the company's 2025 vision, a plan to make appropriate technology investments, it is replacing its legacy e-commerce sites with a global cloud-based system in the coming weeks. Clarks is known as a British company, but it is a global brand, owning the best-selling shoe in Jamaica. It is expecting to see £1.6bn turnover this year, with £128m net profit, and it has a five-year plan to continue its strong growth in e-commerce. 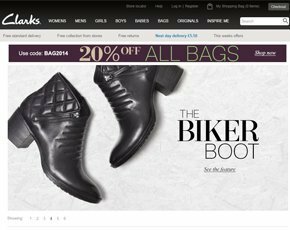 Clarks' legacy e-commerce platform has already been recognised with awards, but David Grant, director strategy and infrastructure at Clarks, says the time has come to combine the siloed websites from around the globe, using SAP’s Hybris system. At the moment, the retailer has 23 legacy websites in Asia-Pacific hosted on various platforms, with different systems again in the UK and the US. But from October, Clarks hopes to go live with its new Pangea platform. The company’s CRM platform is also being reduced from 14 systems to one global system as part of the 2025 strategy. Clarks is also investing in a platform to provide a near real-time visibility of stock. Currently, the retailer has visibility in the store, but for the rest of the supply chain only on a daily or weekly basis. While this is in the pipeline to be delivered next year, Grant says it is the sheer volume of data that makes this project challenging. "Not only the amount of data, but the changes are happening, such as customers changing orders, or a new line of a particular shoe. “Adapting to the modern market place puts pressure on those systems,” he says. But the retailer has already invested heavily in digital, and it has several concept stores where it has been experimenting with technologies. At its Exeter branch, the shop and staff have been kitted out with iPads and Wi-Fi to showcase the power of cloud in-store. Grant says that, when he stood up in front of the Clarks board of directors and said he was going to deliver it in three months’ time, everyone was shocked. “But we did,” he says. “Cloud meant that, rather than spending three to six months fiddling about in datacenters and trying to install servers and get them working, we could use Azure to provide that capability,” he says. Grant says Clarks has adopted the ‘fail fast’ mentality when it comes to new digital technologies, which allows the 240-strong global IT team to try things out a little bit at a time. “When we did that store journey, we tried things out and it doesn’t always land right and we can try things really quickly, tune it and move on,” he says. Digital signage, virtual mirrors and interactive tables are a few examples of ‘fail fast’ trials that didn’t take off. But rather than forgetting about them, Grant deprioritises them for now and moves on to the next technology trial. A successful trial has seen the implementation of iPads for staff, which can measure the length of a person’s foot – while another small device, linked to the iPad, gauges width. This works well when measuring children’s feet because animated characters can come up on the device to occupy them while the process happens. The iPads have been rolled out to 700 stores. Grant said the reason for choosing Apple is down to the simplicity of experience. But, due to the costs, Clarks is looking at alternative options. However, Grant is concerned that an alternative app wouldn’t be quite so slick and easy to use as the iOS one. The iPads can also send messages to the stock room to bring out the size and style of shoe a customer wants to try on, but this functionality is only in operation in concept stores because it needs connectivity. “We’ve been a bit slow to roll out Wi-Fi in store,” says Grant, who says it’s down to getting the right price for a full roll-out. Around 25% of stores have Wi-Fi and Grant is looking at specific Wi-Fi supplies such as Getronics, which supply to chains such as McDonalds. Clarks is also hoping to incorporate mobile payments into the iPad devices, so customers don’t have to queue to pay for their shoes after trying them on. Again, this is possible in the concept stores and Grant wants to make this more mainstream over the next few months. A request for proposal (RFP) has been made to analyse the market and Grant says payment is going to be one of the biggest challenges for the company to get right. As digital technologies are becoming increasingly available to retailers, Clarks – and others – must make the tricky decision of where to put their money. Grant points to 3D printing as another technology that could revolutionise the market. High-end shoe retailer Jimmy Choo has already been 3D printing shoes and Clarks has played around with the technology too.